If you’ve received an email from us about documents being posted on your portal, what should you do? 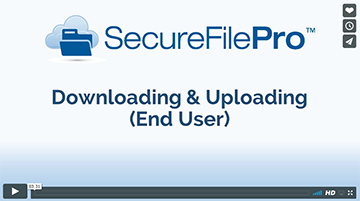 This explainer video outlines the steps you should take to connect with the portal and login to your SecureFile Pro account. Click the video image to play the video. Feb 8: Tax Reform Changes for Individuals (booklet) from the IRS. Plus, Small Business Tax Reform and Tax-Exempt Entities Tax Reform – It’s Impact. Jan.: 2019 Health FSA Contribution Limit Announced. How much can you save in 2019? Jan.: 2019 Standard Mileage Rates Announced. Did they go up or down? Find out. December: New tax credit benefits employers who provide paid family and medical leave (FMLA). The facts, plus how you can claim it. November 13: IRS Releases Tax Reform Basics for Individuals and Families. Get your copy!